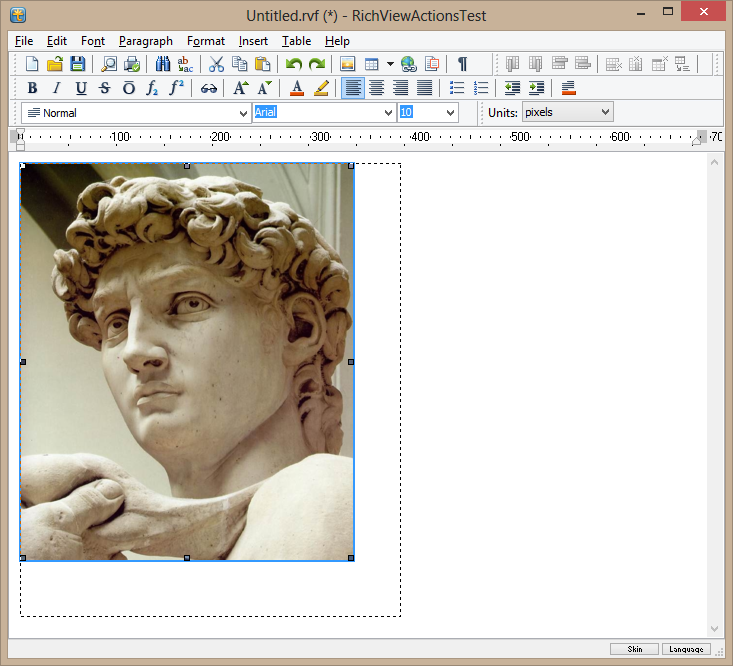 Gif images (TGifImage, a standard graphic class since Delphi 2007). Png images (TPngImage, a standard graphic class since Delphi 2009; TPortableNetworkGraphic in Lazarus). Tiff images (TWicImage, a standard graphic class since Delphi 2010; TTiffImage in Lazarus). Anymap images (TPortableAnyMapGraphic, in Lazarus only). Additional graphic formats can be supported with third-party graphic classes (descendants of TGraphic). 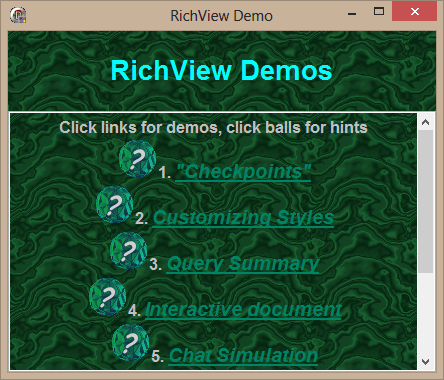 Additional information: How to use PNG and GIF images in TRichView. 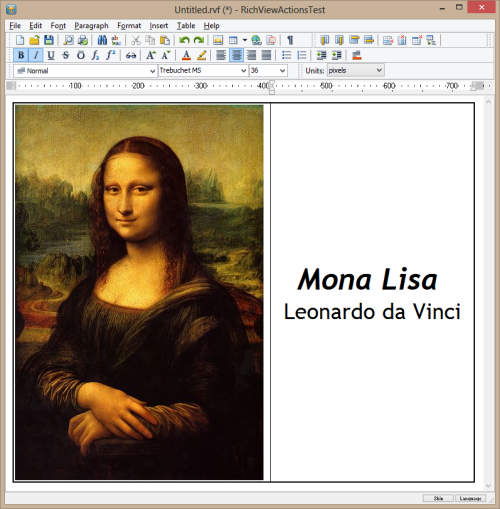 Users can resize images with the mouse. Bitmap animations (a bitmap is divided into frames). You can add a bitmap image to the background. This image can be centered, stretched, or tiled. Tiled images can be fixed or scrolled with the document's content. Tables and cells can have background images as well. This is an unique feature of TRichView. Another way of adding images is to insert them in Delphi/C++Builder controls (such as TImage), and then insert such controls into a RichView document. 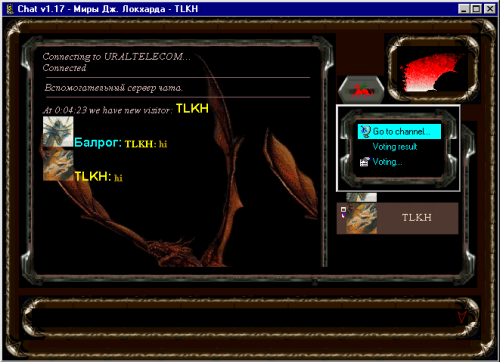 Animated images can be inserted as well. How to play AVI movies in TRichView. How to play SWF (Shockwave flash) in TRichView. 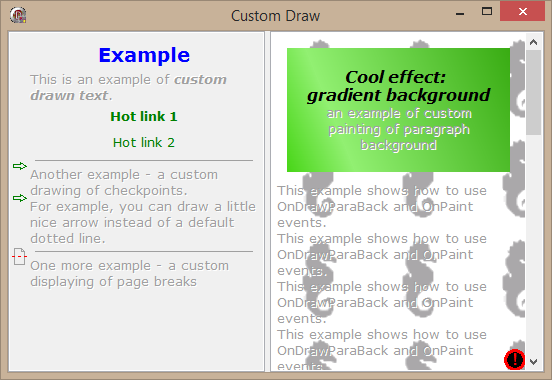 You can draw your own backgrounds and widgets with the custom-draw feature. Images can work as hypertext links. Hypertext images (hotspots) from an Image List can change their appearance under the mouse pointer. You can see an additional types of TRichView document items displaying translucent images with the specified value of transparency (TRVBlendBitmapInfo). Images (like other non-text objects) can be placed inside a text line, aligned to the top, the middle, the bottom of the line, or to the base line of text; or they can be aligned to the left or right side, with text flow around them.